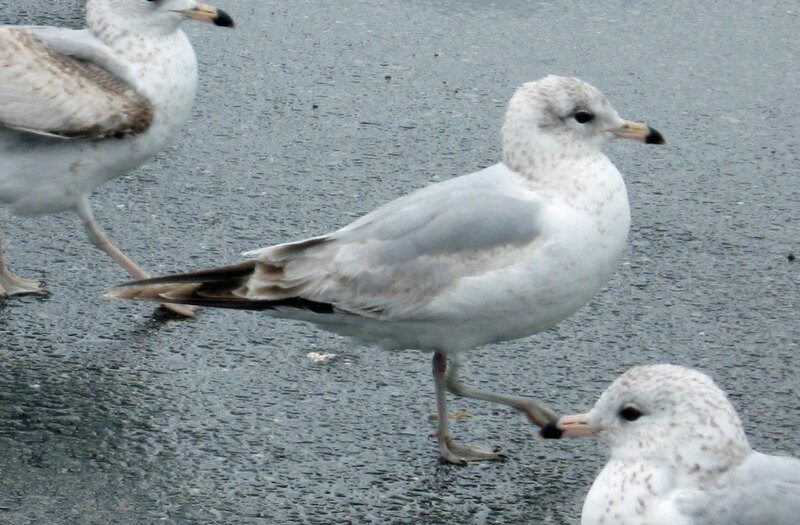 Previously I wrote about the variation in immature Ring-billed Gulls in October, using a series of photos from Cape Cod. 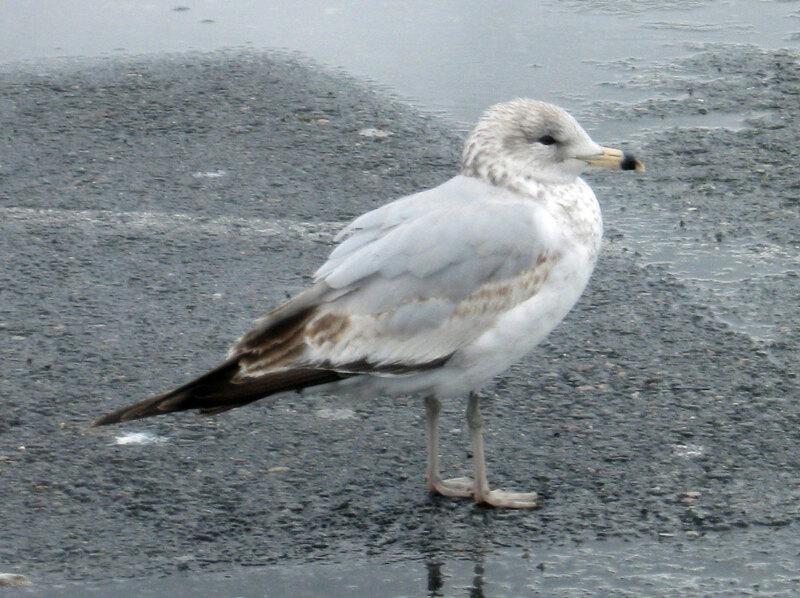 On 18 April 2010 I devoted a little time (and a granola bar) to watching and photographing immature Ring-billed Gulls in a parking lot in Boston, MA. As always, looking closely at a common bird brings up all kinds of questions. Here is the survey of plumage variation, and I’ll follow-up with some of the questions. 1. 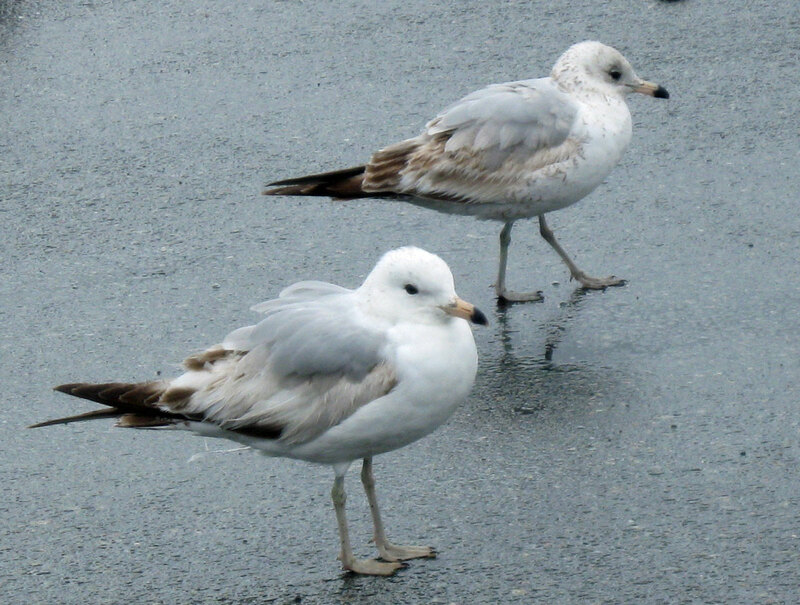 Two Ring-billed Gulls the same age at about the same stage of molt. The variation in these two birds arises mainly from the extent of dark markings on the newly molted head and breast feathers and the degree of wear and fading on the old retained juvenal wing coverts and tertials. Boston, MA, 18 Apr 2010. Photo copyright David Sibley. In the photo above, the whiter bird in the foreground has excessively worn, whitish wing coverts retained from last summer, clean white head and breast of presumably new feathers grown in the last few months, but is otherwise nearly identical to the bird behind. 2. 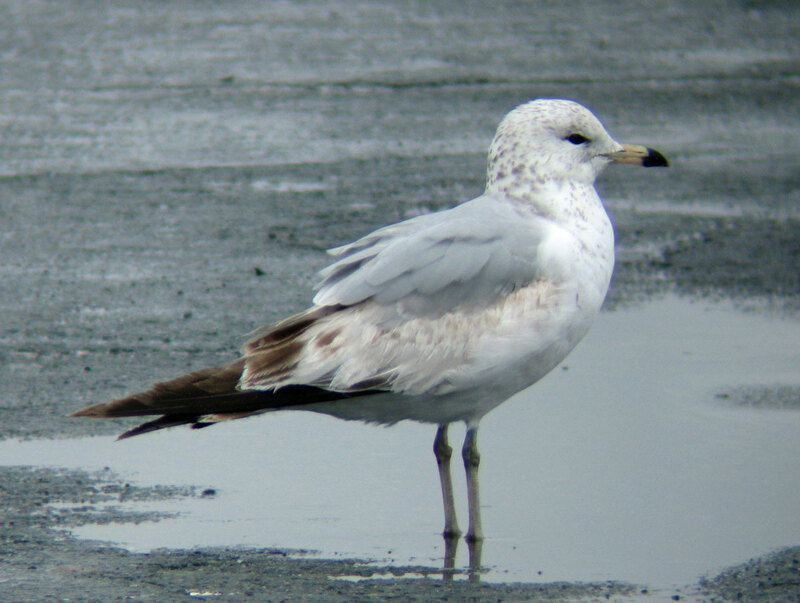 First-spring Ring-billed Gull. This bird was the darkest one seen, and has very strongly-marked and fresh-looking wing coverts and tertials. Presumably it started out last fall with relatively dark markings on these feathers. Looking at the tertials we can see the effects of wear, and how melanin (dark pigment) actually strengthens the feathers so that the white parts wear away first. Boston, MA. 18 Apr 2010. Photo copyright David Sibley. 3. 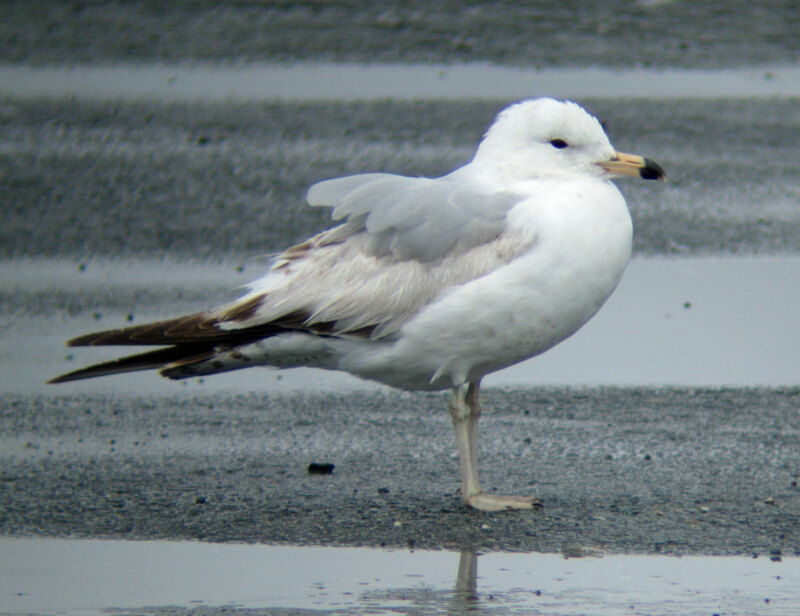 First-spring Ring-billed Gull. Wing coverts weakly-patterned but still relatively unworn, tertials significantly darker than coverts. Boston, MA. 18 Apr 2010. Photo copyright David Sibley. 4. First-spring Ring-billed Gull. Boston, MA. Wing coverts weakly patterned, tertials brownish and somewhat worn and faded. 18 Apr 2010. Photo copyright David Sibley. 5. First-spring Ring-billed Gull. Boston, MA. 18 Apr 2010. Photo copyright David Sibley. 6. First-spring Ring-billed Gull. Wing coverts strongly worn and tertials very faded, unlike the preceding birds which have the tertials still fairly dark. Presumably this bird had paler tertials from the moment they were formed last summer, and therefore more susceptible to wear and fading. Boston, MA. 18 Apr 2010. Photo copyright David Sibley. In this sample the two birds below with the most heavily worn (and very pale) wing coverts are strikingly different from the darkest bird show in figure 2 above. Presumably these very faded birds were the individuals that had the palest coverts in the fall (e.g. birds 4, 7, and 9 here). These birds now also show a very pale whitish head and breast. The head and breast feathers should have been replaced in the spring molt, while the wing coverts are retained from last summer. So the white head and breast are the result of new, unpigmented feathers, while the white coverts are the result of excessive fading on old lightly pigmented feathers. So maybe birds that produce less pigment in the fall continue that trend in the spring? Or maybe a larger sample size would show no link between extremely faded wing coverts and white heads? 7. First-spring Ring-billed Gull. Wing coverts and tertials extremely worn and faded. Boston, MA. 18 Apr 2010. Photo copyright David Sibley. 8. First-spring Ring-billed Gull. Boston, MA. 18 Apr 2010. Photo copyright David Sibley. Wing coverts excessively worn and head and breast nearly pure white. Besides variation in feather color and the intensity of wear and fading, birds can also differ in appearance depending on how many feathers have been replaced in the spring molt. The three individuals below have all replaced some wing coverts and tertials with new – grayish – feathers. A study by Kevin McLaughlin (2000) shows photos of Ring-billed (and Laughing) gulls that have replaced many of their wing coverts and tertials with new gray feathers, and his photos are from the fall. So it’s possible that these birds below actually acquired new gray coverts and tertials in their first post-juvenal molt last fall, although some additional replacement might happen in the spring. 9. First-spring Ring-billed Gull. This bird is similar in plumage color to those above, but has undergone a slightly more extensive molt, with a few new gray feathers among the wing coverts and tertials. Boston, MA, 18 Apr 2010. Photo copyright David Sibley. 10. First-spring Ring-billed Gull. 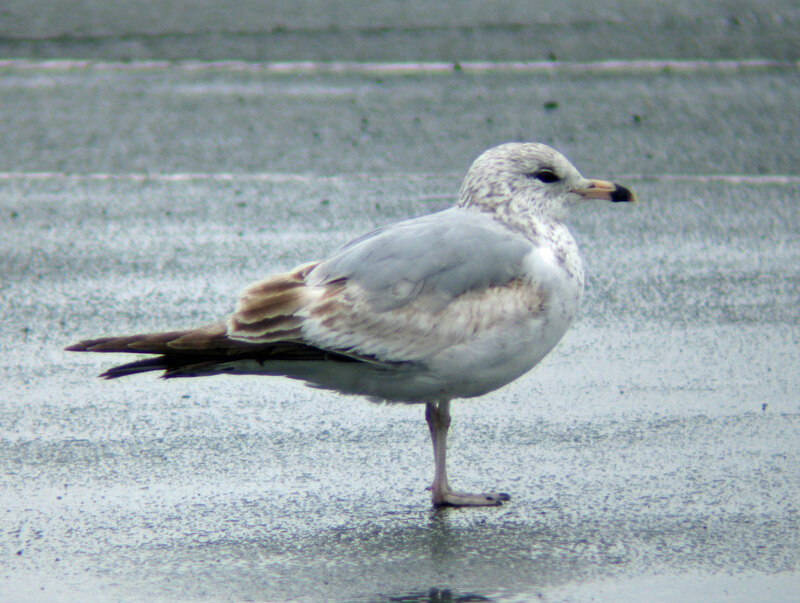 Another individual with a few gray wing coverts, this one also advanced in bill color with a pale tip already showing. Boston, MA, 18 Apr 2010. Photo copyright David Sibley. 11. First-spring Ring-billed Gull. 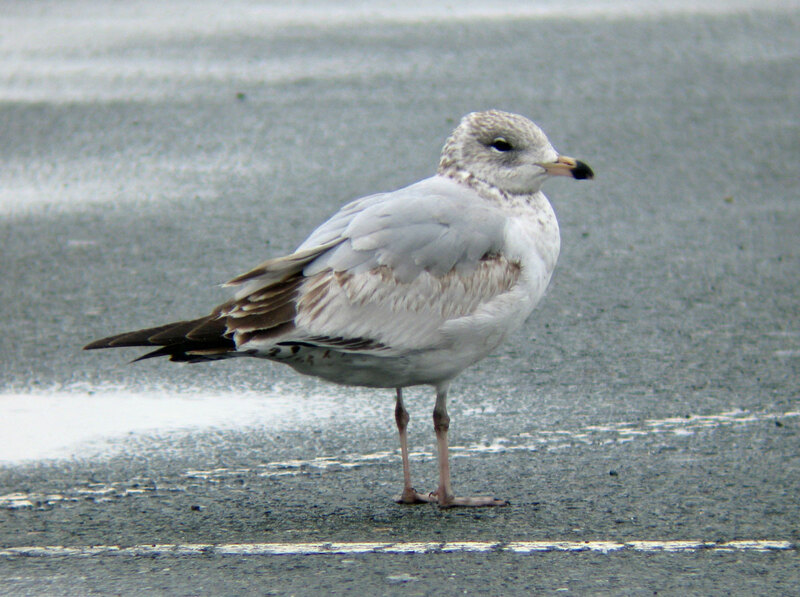 This individual appears fairly "average" in color, but has replaced a lot of wing coverts with new gray feathers. Boston, MA, 18 Apr 2010. Photo copyright David Sibley. 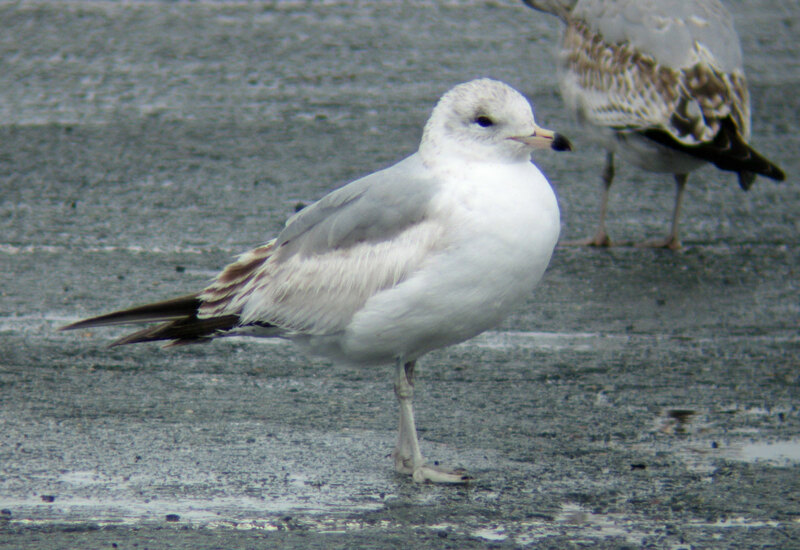 Is a whiter head and neck always associated with extremely pale and faded wing coverts in 1st spring Ring-billed Gulls? Another source of difference in fading — in addition to original darkness of feathers — is wintering site and how much sun the different sites see at that season. RBGUs wintering on the Great Lakes (which can be incredibly gloomy in winter) probably don’t fade anywhere near as much as birds wintering in FL. While your April Boston birds almost certainly did not winter on the Great Lakes (for geographical reasons, if nothing else), various individuals could easily have come from very different wintering sites, with some, perhaps, being local winterers and others coming from farther south. Nice pictures! thank for sharing with everyone! How much does actual date of birth factor in, as there can be up to 3 months difference of hatching in different colonies and with latitude? I also see this in ducks when they are moulting into and out of eclipse plumage? That’s a good question. I’m sure hatching date has some effect on plumage and molt, but I don’t know of any direct evidence. Thanks for this article and photos. I have a couple of pictures which I took in Sequim, Washington in 2010. 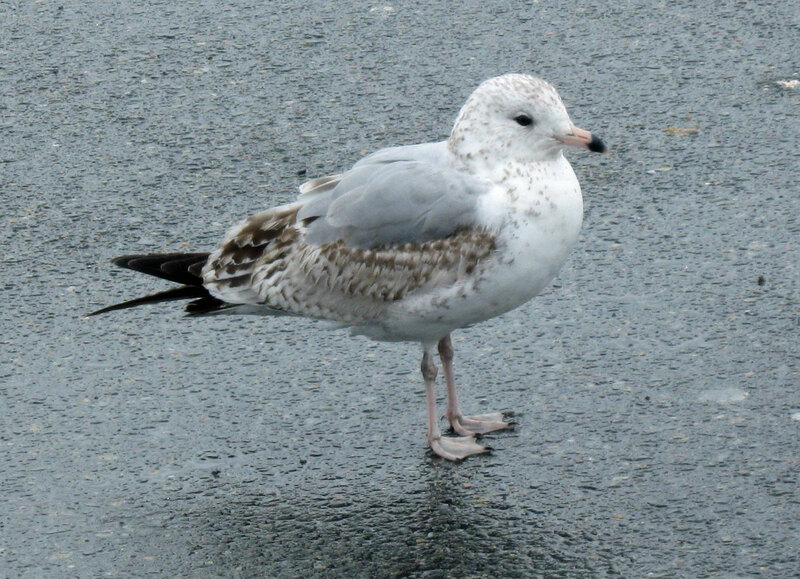 The gull in my photos has crisp new feathers — a soft brownish gray, with white edges, giving the bird a scalloped look. 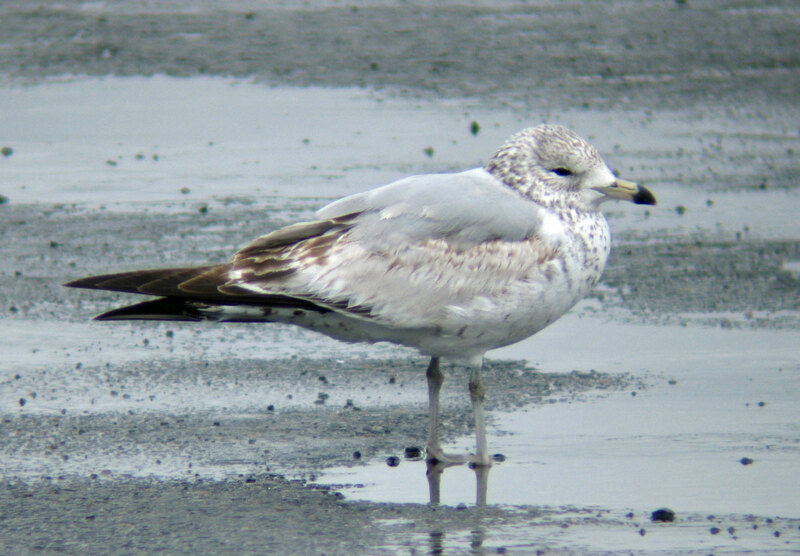 The tail feathers and wingtips are darker gray. What throws me off is that the bill is solid black. (Eyes are dark legs are dark but not black). 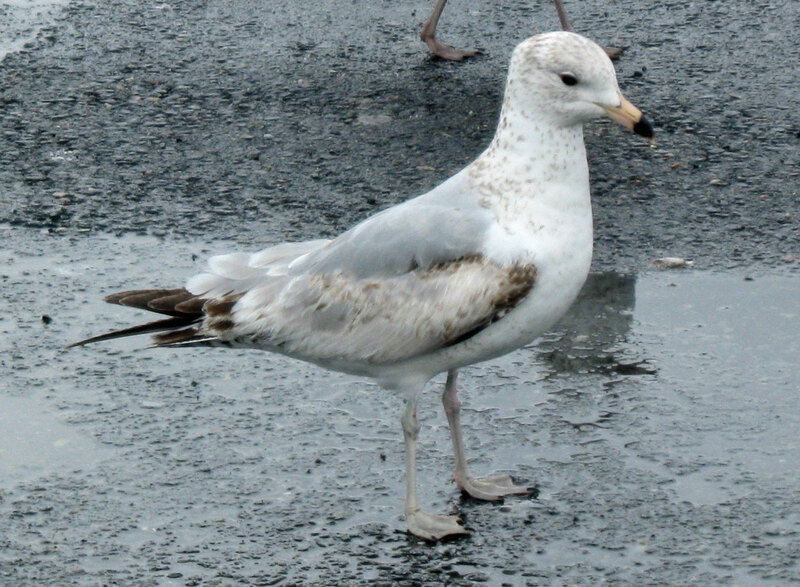 So do Juvenal Ring-billed Gulls ever have completely black bills?